Kejoro is a female yokai described to resemble a young woman from a distance until one gets closer to see her face and upper body engulf in long, raven black hair. A few myths mention her entire body is cover in thick hair like animal fur. Anyone looking upon a kejoro would notice no eyes, month, nose or any other human feature, just hair. Men often fall victim to kejoro as she appears within brothel acting as a prostitute. Any male seeing her from behind believes she is woman they recognized from the past. When the man then approaches to talk with the kejoro, he discovered a woman enveloped in long black hair. Such encounters results end with the male entangled in the hair while being sliced up by sharp strains. Reason why she kills vary from eliminating those who had discovered her presence to self-defence thinking the men will attack upon learning what she was. The legend of kejoro is recorded in Toriyama Sekien’s One Hundred Demons of the Past and Present. In the book, the yokai maybe not friendly towards human, but is popular among male yokai as they would seek out her company. If kejoro ever fell in love, she demonstrated her devotion by cutting off her own hair and handing it to her love or tattooing their name on her skin. 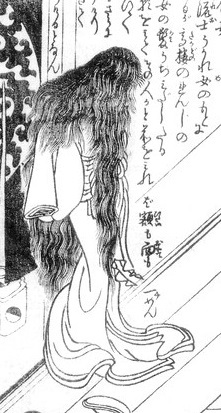 However if male was ever unfaithful the wrath from this yokai ended with dismemberment by her hair.